I’ve always been open to signs, you know, like an answer to a meaningful question via the appearance of a rainbow, a bird crossing my path or something else that tells me what I need to know. Though I’m open to signs, I can’t think of a time when I actually had a meaningful sign. I found this rock, or chunk or concrete while I was running. I picked it up and ran home with it in my hand and the moment I spotted it, I thought “Ah! 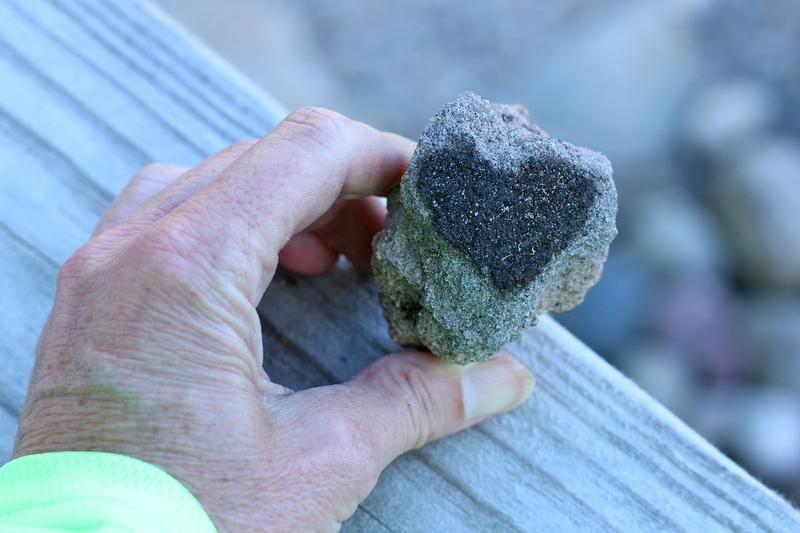 A heart rock for Sally.” Sally is my friend from the Neahtawanta Inn in Traverse City. She collects heart-shaped rocks. Her husband Bob Russell, died August 23 from cancer, which he fought for almost three years. I met Sally and Bob when we stayed at the Inn in 1988. I was pregnant with Noah. While Noah was growing up, we stayed there, too. I like to think that they built the accessible room at the Inn just for us! I’ll bring that rock to Sally, in memory of Bob. While running, before I found the rock, I was thinking about meetings in the afterlife. When someone dies, I’ll say a little prayer to Noah (since he’s an angel now) and ask him to keep an eye out for whomever might be arriving. I don’t know if Bob was a heaven-believer or not, that isn’t important. What matters is that Noah is looking for him, to welcome him to a new place. Before I ran this morning I received an e mail that chapter from my memoir that I’ve been working on as a stand alone piece was accepted for web exclusive publication in Brain, Child, a literary journal for mothers. Other authors who’ve been published in it include Jane Smiley and Anne Tyler. The piece I submitted is titled, The Orders and is about when Mike and I chose to sign do not resuscitate orders and allow natural death orders for Noah. One of my 2013 new year’s resolutions was that come September I’d start sending queries for my memoir to literary agents. I also wanted to see six pieces of it published–that would be another sign it was ready. That time has come, Brain, Child is the sixth. Also, Noah would have been 25 on September 23 of this year and all these numbers seem like a sign to me.